Amphorae, the urns painted blue in this image, are a fixture of Greek architectural and landscape design. The shapes date back to ancient times when they were a standard storage vessel for oil, grain, wine, and other goods, and were made by the thousand. 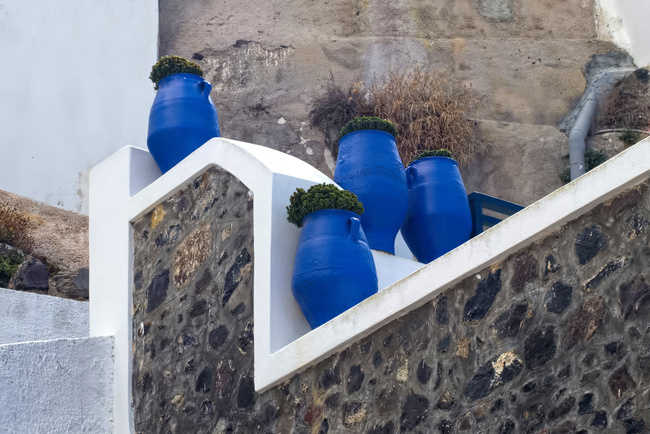 Today, modern-made amphorae are found as decorative planters, as in this photograph, where they have been painted blue to help them stand out against the gray-beige of the surrounding walls made with indigenous rocks.